“The significance of trade-marks in the textile industry is, perhaps, greater than in any other industry of equal magnitude,” wrote V. Alexander Scher (no relation to Paula or Jeff) of Richards & Geier, patent and trademark attorneys, New York City. 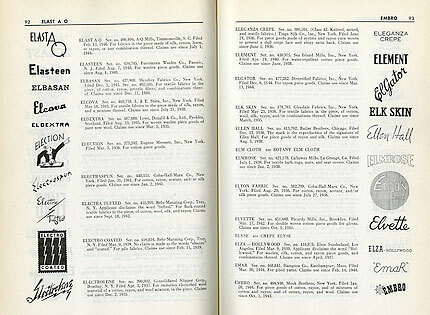 He was writing in a now forgotten book titled Textile Brand Names Dictionary, which was published in 1947, designed “to be of daily service in identifying the names already in use, thereby facilitating the choice and registering of new names and marks,” asserted the editor at the Textile Book Publishers Inc. Included were more than 4,000 names of fibers, yarns, fabrics, and garments registered with the United States Patent Office between 1934 and 1947. 4,000!!! That’s a lot of 7th Avenue brainstorming to devise names like Devogue, Denicron, Glritone, Glossitwist, Ma-Tex, Perma-Fluff, Permacrisp, Perma glaze, Permaglo, Perma-Seal, Permaset, Perma-Shade and Permoflex, to name a few (today they could double as rock band or design firm names). Naming products is a craft as old as the marketing of consumer products, beginning just prior to the twentieth century and continuing to this day. As Mr. Scher notes “trade-marks are indispensable not only to manufacturers…but also to merchants in the advertising of their goods.” Of course we all know this simple truth, but in 1947 “branding” was barely even considered a pseudo-science, no less a major industry, but Scher correctly predicted “trade-marks will continue to gain importance in the years to come.” This book was possibly the first American primer on how to “select” a successful mark. So, in the spirit of advancing design history it is instructive to read what our ancestors believed were the ideal trademarks. In the words of Mr. Scher “A new trade-mark should be selected with great care.” Well, that makes sense. But here’s the real take-away, which was still novel in its day: “A good trade-mark should consist of some short and expressive term which must be sufficiently striking to linger in the memory of the purchaser. 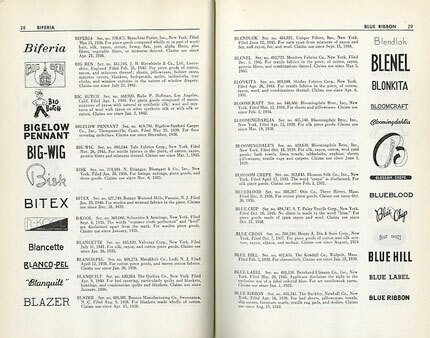 When selecting an appropriate trade-mark, it is most important to take into consideration the character of the potential purchaser as well as the nature of the merchandise itself.” Can you guess who names like Kinkitone, Lookool, Old Standby, Strutter, Strawberry Blonde, and Yippee were aimed at? Marks not only defined the respective companies but the ultimate users; it was necessary to have intimacy yet not informality. Scher advised “It is preferable to choose a mark which consists of a coined word or words, symbol or symbols, or a combination of the two, since coined words or symbols will unfailingly become associated with their owners…. On the other hand, a word which is descriptive of the nature and quality of the merchandise is not a good trade-mark since it does not distinguish the goods from the products of another. 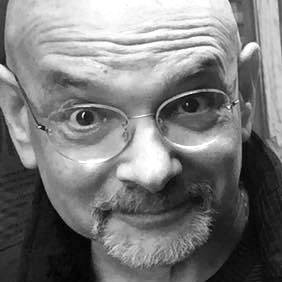 Similarly, proper names or geographical terms are not, as a rule, good trademarks, since it is only after long use that they acquire distinctive character and thus become capable of properly identifying their owners.” This latter word to the wise has its exceptions — i.e. Canada Dry and U.S. Steel seem to have worked, but they are not textiles, and with the notable exceptions of Grenfell of Labrador and NY-Tee I did not find any other geographical locales as brand names. Much of Mr. Scher’s advisory focused on the meat n’ potatoes — registration — specifically the Lanham Act instituted on July 5, 1947. Protection under this Act was broader than previous mandates. “The Act makes registration incontestable by another party after five years of continuous use following registration, unless certain specific causes for cancellation exist.” So, I wonder whatever happened to the original Tropicana, which was registered in 1936 to S.J. Aronshon, New York, who produced rayon and silk fabrics. This directory vividly underscores the principle of don’t mess with success: The most common prefixes (like Gold — Gold Crest, Gold Medal, Gold Rose, Gold Seal, Gold Spun, Gold Star, Golden Fleece, Golden Fleet or Doebara, Doelene, Doepac, Doesheen, Doeskin, Doe-Suede, Doevel, Doe-Vella) were repeated in different forms for many brands. Certain suffixes also dominated like, Spun, Tex, Lastic, and Net. And of course, French sounding names were high on the overused list, like those with “ette” (i.e. Blancette, Dem-Ettes) or “elle” (i.e. Corsetelle) at the end or these, Calais, Cale, and Calide. This was also the era when SMS expressive spelling came into their own as with Everstai-Dri, Fash-un-Sho or Ev-R-So. Alliteration was also popular, like Kameo, Kandoo, Kant-Fade, and Kook-Kist. Yet among these 4000 few brands actually continued for these many years, notably Celanese. So if you’re in the market for a name, this book is for you. I've got to find a copy of this! It's right up there with another great resource - The Collector's Handbook of Marks and Monograms on Pottery and Porcelain of the Renaissance and Modern Periods! Great post, really help me a lot. Thanks. It would be great to get a hold of this truly amazing book. I think that trademarks are more that just something in the law, they are also really beautiful (potentially). It looks like a really cool book.